We are located in Old Town Orcutt a vibrant, growing California community that kept its traditional western roots. We are known by most as the "Central Coast" with it's grape vines, cowboy or cowgirl attitude and now its love of yoga. 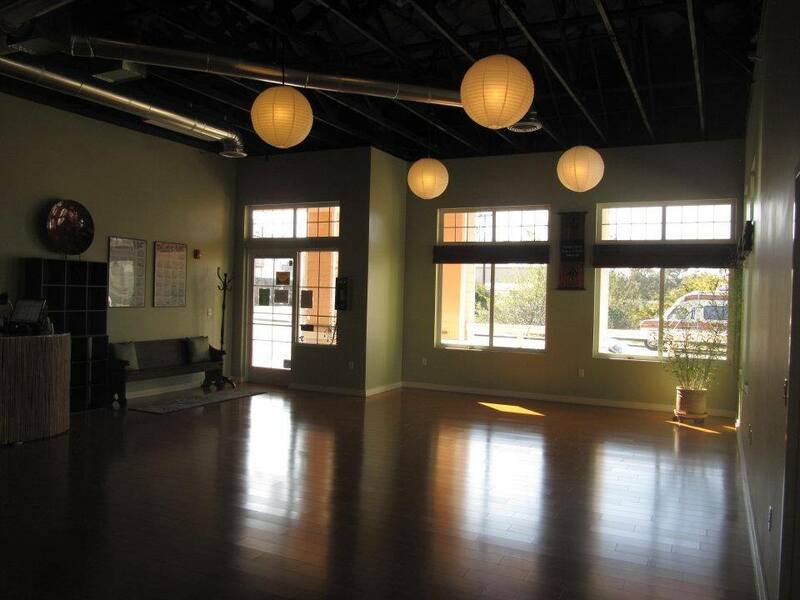 Our yoga studio specializes in many different styles of Yoga and Pilates by combining East meets West. New ideas and approaches without losing sight of Yoga's rich tradition, that's our difference. The best instructors in Hatha Yoga, Beginning Yoga, Vinyasa Yoga Flow, Mat Pilates, Restorative Yoga and Gentle Yoga Flow are here to provide the right yoga for everybody. 1.) Hatha, Restorative, Vinyasa, Beginning Mat Pilates, Advance Pilates, Gentle Yoga flow and Yoga Stretch & Strength. History: Established in 2005 The Yoga for Mankind studio open its doors on January 3, 2012. The business was originally started as a traveling Yoga studio - with 10 classes taught around the Santa Barbara County area - Santa Maria, Orcutt and Lompoc. 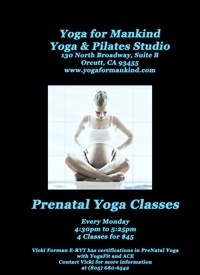 The Yoga 4 Man business has a huge following by means of "YouTube" and daily Yoga/Pilates Shows on Comcast TV. The Yoga 4 Man website sells Yoga and Pilate's DVDs. The Yoga and Pilate's classes grew from 10 students to 50 students, and it was a natural decision to open a Yoga studio. Now we are located In Old Town Orcutt for the Santa Maria area, Lompoc community, Solvang and Santa Ynez. Meet the Business Owner: Vicki A. Vicki has been in the fitness industry since 1992. She has been certified with ACE (American Council on Exercise) since 1996. She has been teaching Yoga since 2001 and received her first Yoga training in Hermosa Beach under Beth Shaw. Vicki studied for five years and earned her Yoga Alliance Certification in 2006. She completed her advance training as a RYT-500 from Integrative Yoga Therapy at the Kripula Center in Massachusetts. Vicki has her BA in Liberal Studies from Fresno State with a focus in child development. This last two years she has worked with Judith Lasater the founder of Yoga Journal on Restorative Yoga and now has her certification in "Relax and Renew". Vicki has her ACE certification in Mat Pilates with Paula Anderson of Balanced Body. For the last three years she has been a member of the International Association of Yoga Therapists. She currently directs and produces a television series called, "Yoga Stretch" which airs daily on Comast TV.